Online Shopping is slowly growing in India. There are a large number of online shopping portals out there. It’s indeed a difficult task to figure out which site is reliable and which is not. 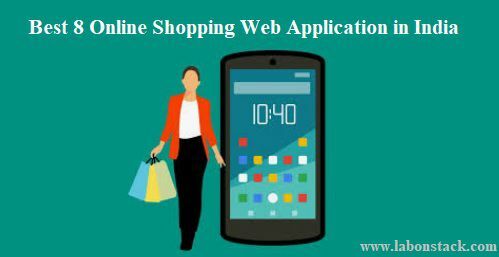 Here we are listing out India’s Top 8 Online Shopping Web Application to help you take the right decision in choosing which one to go with. Today, a large number of people want to purchase everything from online. It becomes very easy to buy anything and everything you want because they provide facility like pay online, cash on delivery and home delivery facilities, shopping for the best thing – be it a gadget or clothing – has now become a less hectic job. Flipkart is the best website for online shopping in India. The entire country is completely dependent on Flipkart for nearly all their shopping needs. In fact, statistics claim that there are more items on Flipkart than in a mall. Hence, Indians are heavily reliant on Flipkart for all their shopping needs. Flipkart sells everything from gift vouchers to electronics to home appliances. Offers and discounts along with free home delivery for the purchase of goods above a certain amount is another plus point of Flipkart. Another thing about Flipkart is that it never disappoints you. The global online marketing leader is my personal favorite – Amazon. A large number of people from India swear by the services of Amazon. Amazon has an equally large number of products as Flipkart. Better shopping experience, consistency, lesser scams, better customer service, and overall a great pleasure. Finding products on Amazon is super easy and checking out is easier. Agree that they might not be as “popular” as Flipkart, but considering my experience with them, they are better than Flipkart in most cases. Snapdeal is a completely Indian website and is often preferred by the masses for its cheap rates. India’s Ultimate Online Shopping Site Snapdeal’s vision is to create India’s most reliable and frictionless commerce ecosystem that creates life-changing experiences for buyers and sellers. It sells products at really low prices and hence, is a favorite of the masses. It is a good idea to buy from Snapdeal if you are looking for absolutely cheap prices. Ebay.in is the Indian version of the International online marketplace, ebay.com. eBay has a wide range of used and brand new products from footwear to electronic gadgets, all under one roof. One good thing about eBay is that it promotes small businesses and passionate individual businesses as well, as it allows buying products directly from vendors. eBay makes sure that the vendors are trustworthy, hence making the site pretty much reliable. ‘Fashion’ is definitely more accessible with Jabong.com. Jabong is again an American brand but seems to be doing very well in India. Launched in 2012, it got the highest traffic within one year. It has all kinds of products from western wear to desi Kurtis and it would be fun to sit home and shop for clothes on Jabong. The website has discounts and offers too for all the listed products. Jabong is excessively preferred by women shoppers. Jabong is undoubtedly a favorite place for people who love new fashion trends. The main attraction is that the shipping of products comes for free. Myntra.com is yet again an online fashion store. An equally large number of women favor Myntra over Jabong. Myntra also has a large number of accessories and clothes on its online portal. Myntra offers apparels, watches, bags and a lot more for discounted prices. Casual wear, ethnic wear, party wear, formal wear, sportswear and other apparels for men, women, and kids are available for various prices and fashions in Myntra.com. Shopclues is famous for their heavily discounted best shopping deals. Shopclues one of the best and the fastest growing online shopping websites in India. Shopclues is one of the best online stores that offer a wide variety of Mobile, cameras, Computer accessories, Jewellery, Cosmetics, Gift, toys, clothes, books, and bag. For those who love to have a high-quality shopping experience, this is one of the best virtual places to beat, which involves reliable, genuine and real stuff. Started just as mobile recharge app, now Paytm become the Indian Alibaba. Paytm offers cashback with the discounts, that makes it different from other shopping sites in India. Provides a number of services like mobile recharge, bill payments, tickets etc. along with a variety of generic products. Sometimes such cashback makes a big difference and saves your extra money. Android Vs iOS: Which is the Better Smartphone Operating System?